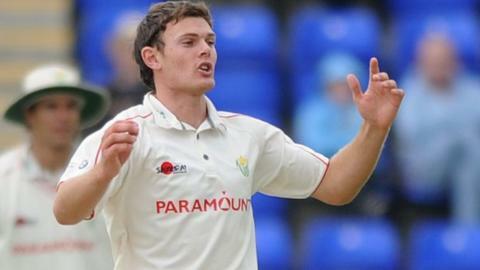 Welsh seam bowler James Harris has been promoted to the England squad for the 50-overs series against New Zealand next month. Harris will be in contention for his senior England debut in the three match series from 17-23 February instead of playing for England Lions in Australia. He was called into the England 20-20 squad in India last month but didn't make the final eleven for either game. Harris left Glamorgan for Middlesex at the end of last summer. National selector Geoff Miller said: "James Harris has worked hard with the England performance programme this winter." England test squad: Alastair Cook (capt), James Anderson, Jonny Bairstow, Ian Bell, Stuart Broad, Nick Compton, Steven Finn, Graham Onions, Monty Panesar, Kevin Pietersen, Matt Prior, Joe Root, Graeme Swann, Jonathan Trott, Chris Woakes.